The 2013 Masters begins this week and you can watch exclusive coverage from the practice range to the final round live online. Both Masters.com and longtime broadcast partner CBSSports.com will both offer live streaming coverage of the Masters. The tournament begins on Thursday April 11th, but live coverage begins with Practice Range coverage beginning at 12pm ET on Monday. The Official website of The Masters will feature HD coverage the 2013 Masters tournament all week long. 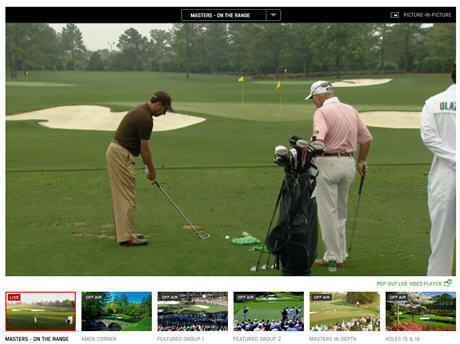 CBS Sports has a different layout, but will feature the same live streaming channels as Masters.com. You can also watch for free on your iPhone, iPad, or your Android phone for free with the Official Masters app.